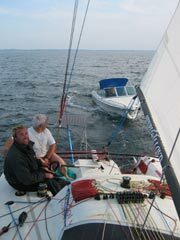 The Demi-Cle is a 950 mile double-handed race of 3 legs that starts from Locmiquelic near Lorient. The legs are Locmiquelic->Brest (via Belle Ile), Brest->St Quai Portrieux (via Lundy Island in the mouth of the Bristol Channel) and then St Quai back to Locmiquelic. Unforunately, this years race was plagued with the same light winds which have effected all of the Atlantic races that we have sailed in. I was again racing with Alex Alley who I had previously raced with in the Min Fastnet. Unfortuatnely, as with the Fastnet, we again struggled to produce our best in the light conditions. Despite the unremarkable conditions, the race was made memorable for us with a somewhat bizarre incident on Leg 2 in which we ended with us rescuing a small speedboat whose outboard engine had ceased working. We had been tacking upwind only about 40 miles from St Quay-Alex was resting and I was helming. I spotted a man waving to us from his speedboat and naturally waved back. It soon became apparent that his wave was probably not just social and but it was a struggle to understand his French shouts (my French being a little hit and miss). I tried to shout back to understand what the problem was (Alex who had awoken below later explained that he though I had lost the plot completely after 5 days and was babbling to myself). I gybed the boat around and headed back to the boat which also had the man's wife and yound boy on board. We circled around while he explained that his outboard engine had stopped working and he had not been able to revive it. It soon became apparent that they were not that well prepared to be out on the water as we discoved they had no VHF radio, phone, charts, paddle or anchor. He explained that he had set off his only flare and managed to attract the attention of another Mini, Arreas, who had radioed for assitance on their behalf before continuing racing. Unfortunately for them no assitance had arrived. Feeling we had few options I decided that the best option was to tow him toward the port of Treguier from where he had come and hope to offload them to another motor vessel nearer Treguier. So, we tied on a tow line and off we set sailing. we were not helped by the fact that our proposed desination was upwind. Sailing a bit off the wind for power we managed speeds of up to 3 knots in the 10 knots or so of breeze. A nice piece of irony came to light as we sailed along as the man, Gill, explained that he worked for Arreas Assurance (Insurance) and was now feeling somwhat less than impressed that the Arreas boat had sailed off wihtout providin more assistance. I joked that they were more than welcome to move their logo and sponsorship to Rafiki and gestured to my blank sails. On reaching the mouth of the river up to Treguier the breeze started to drop and soon the two of us were left drifting on the tide-unfortunatey toward a rock ledge which marks one side of the channel. We got the anchor up on deck in preparation but then spied a small fishing boat further out to sea and managed to coax Rafiki slowly out to intersect with this boat. We hailed the fishing boat down and then exchanged and farewelled our tow. Then we were off and on our way crawling slowly out of the bay at a dwadling 1 knots. It took us about 12 excruciating hours to get in from there as the wind became extremely patchy towards the finish until finally it filled in and allowed many of the boats to cross the line. We were lucky to get in however, since the next large group of boats was another day parked out in the light airs. It was a leg we were glad to see the end of!